whoooo boy is UDK tricky! took me over a week to figure out how to have an interactive object! but everything else will be easy to make now I know how to do it 😀 how hard can a teleporting key be? for each element of the puzzle, i am making a test version in UDK first before i go ahead and create one,giant UDK file which is prone to breaking quite easily. 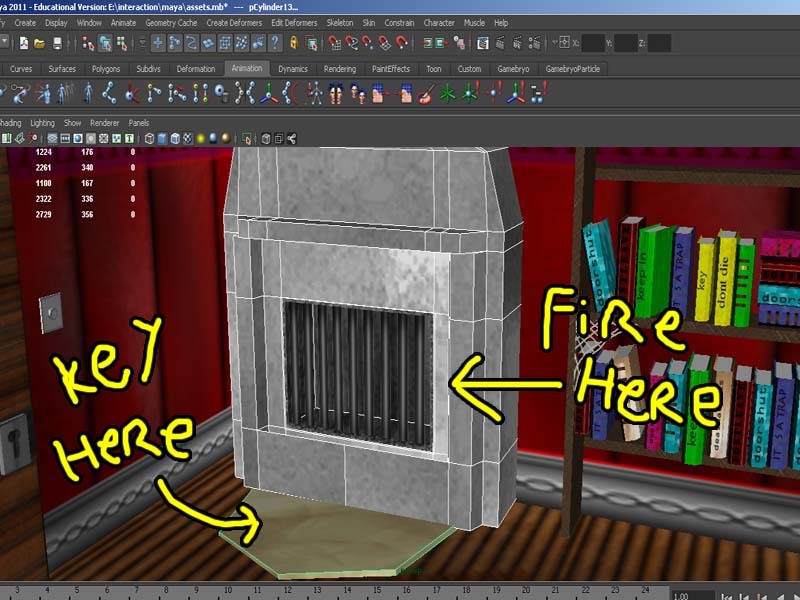 my assets were also vanishing every time I opened UDK :O but luckily I managed to solve that hurdle too. strangely enough the tutor couldn’t help me with either of my queries 😦 but luckily for me there is some amazingly intuitive video tutorials on the UDK website. anyone who is wanting to learn how to use the program should definitely check them out as they helped me a great deal. since the last draft, I`ve revised the puzzles some more. 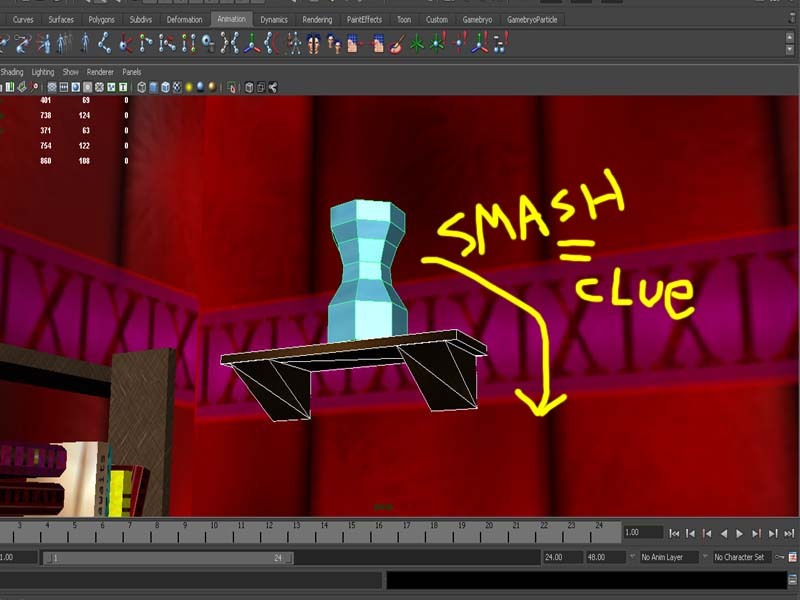 the first slider puzzles will be interactive but the second ones will be activated in a roundabout fashion using the bookshelf. it breaks up the flow and encourages a bit of `hit everything untill you find the solution` exploration. 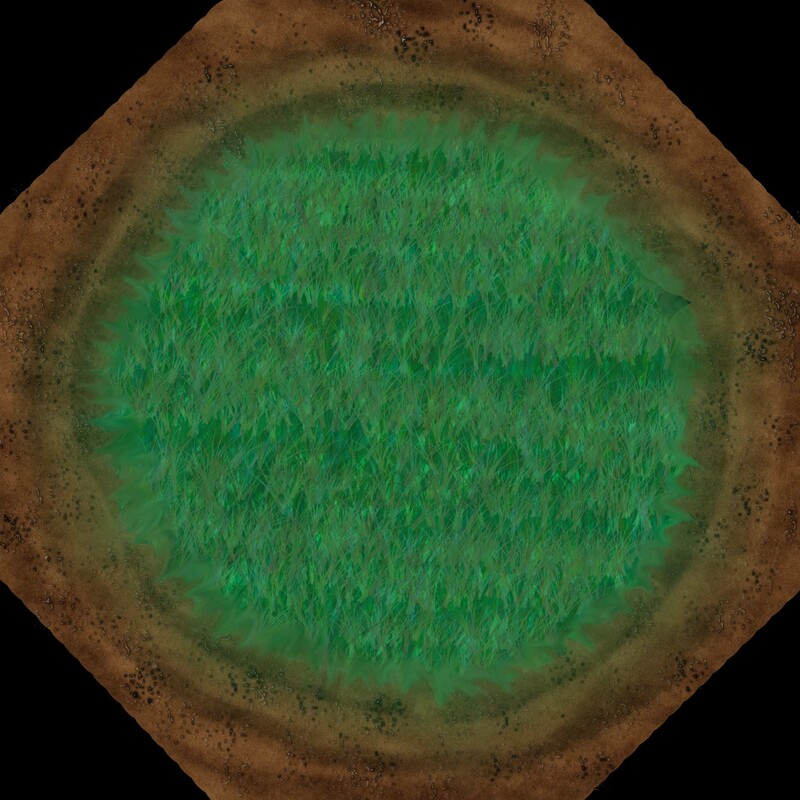 which the level sorely needs, since it`s far too linear and simple at the moment. there`s plenty of extraneous details but they aren’t being acknowledged by the player in playthroughs so i needed to shake up the progression a little bit. another change which isn’t necessarily for the better is the gravity based twist ending. the tutor told me it would be far too hard to do so instead i`ll have the game fade to black once the player leaves the house. one bonus to this is that the outdoors section wont have to be as detailed as indoors. here is some proof of the working puzzle interaction. 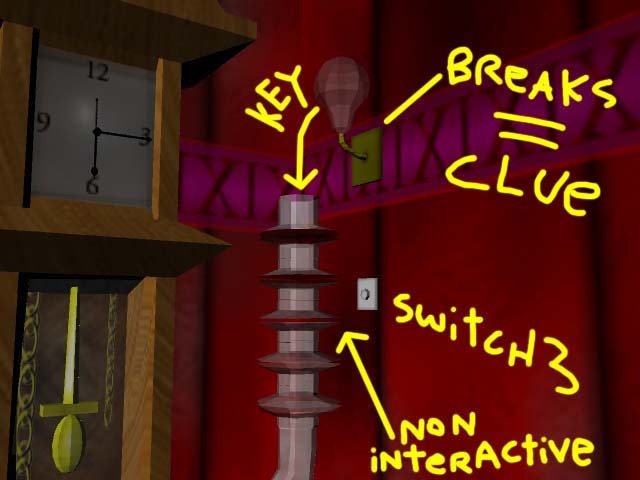 and here’s the prototype of the light switch puzzle. im gobsmacked that I`ve gotten this far. there were so many hurdles to using the software. 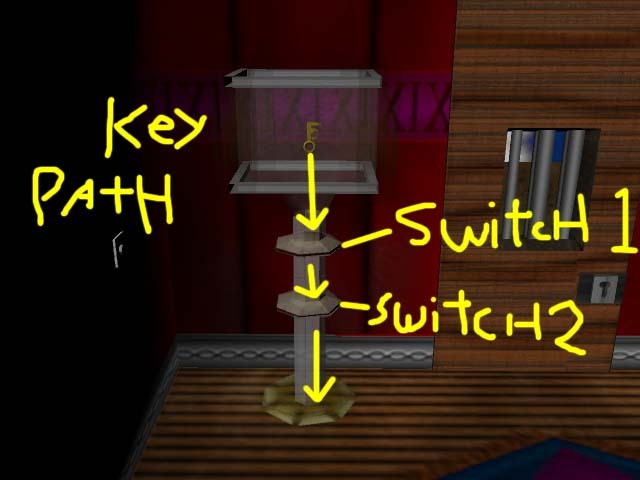 but the techniques behind these two puzzles are essentially the same for the rest of the level so I should be fine. 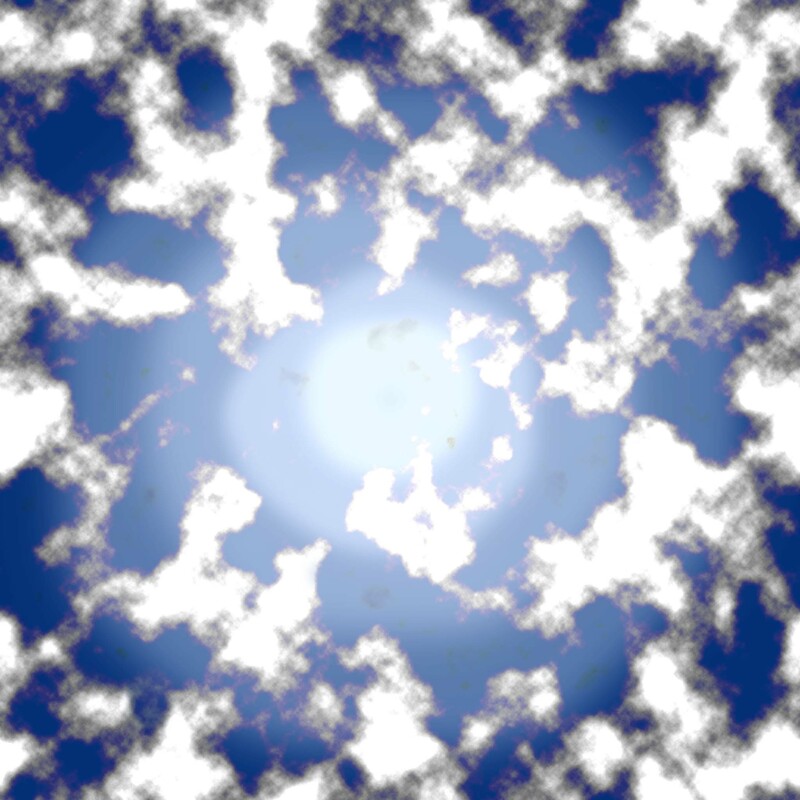 i just need to figure out how to have certain triggers,animations effect the flow of others. 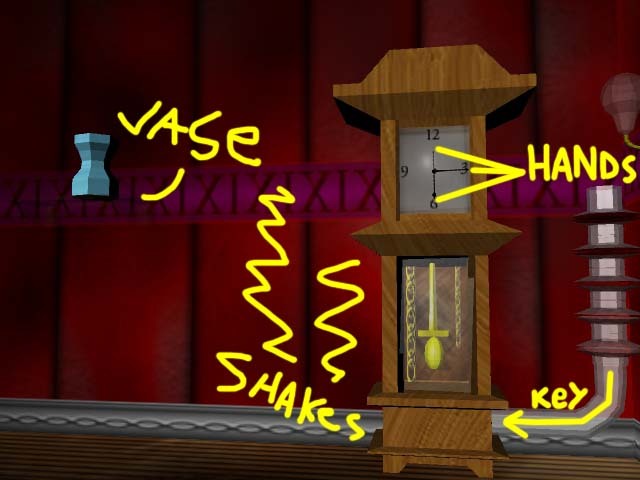 okay,this post is getting far too wordy so here`s a step by step image guide of the puzzle. these first two sliders are interactive. you hit each one it will move in and out (as seen in the first video) allowing the key to fall down. once it falls down to the floor it will reappear inside the first lightbulb which will be the only one currently on. 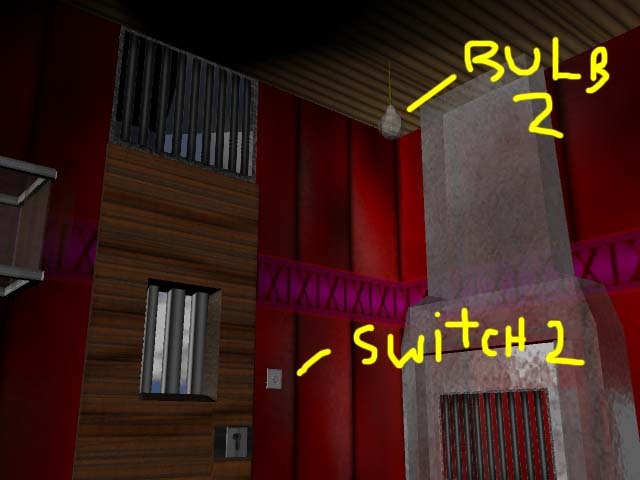 then one more.turn all the lights off then only turn on the wall bulb to move the key. 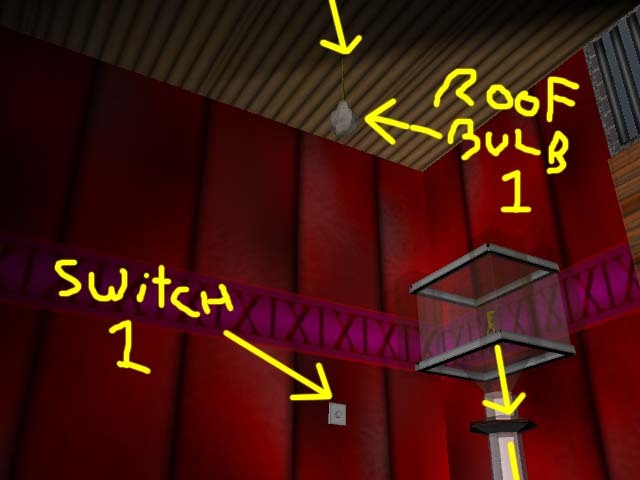 once it`s in the final bulb,interacting with it will make it loose and slam it against the wall (as seen in the second video) causing the key to drop into the second puzzle tube and a note to fall on the floor with the words “helf” written on it. interacting with this puzzle tube is a lot different from the first one. the first idea I initially had was to have the controls reversed so each slider didn’t control itself but another in the tube respectively. instead I will have the controls aligned to a bookshelf across from it. here is the magical bookshelf in question. if you can look closely some of the books have symbols instead of names. 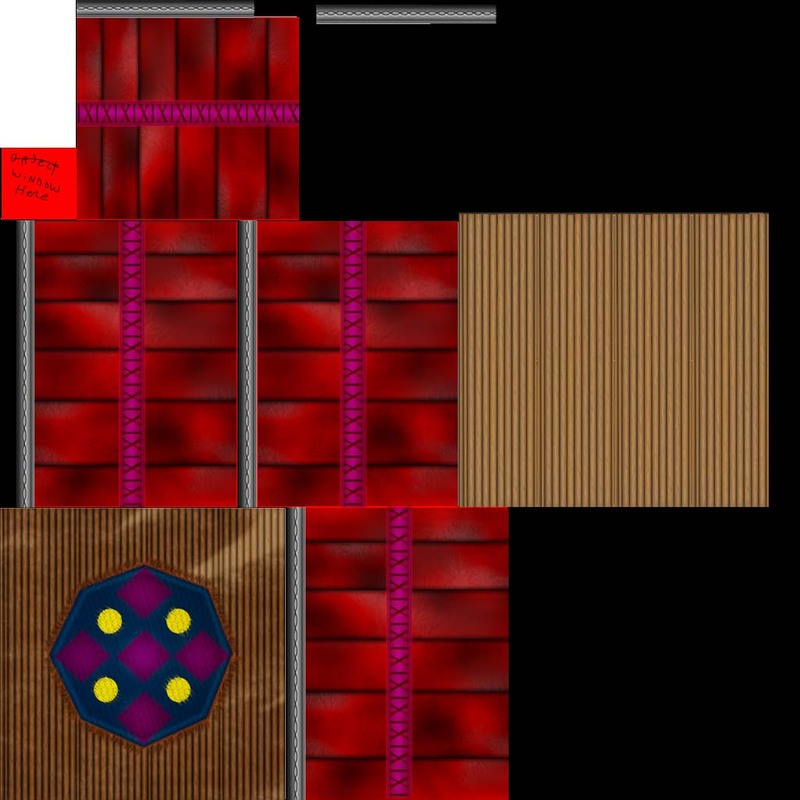 the symbols correspond to the sliders in the second puzzle tube. interacting with them will move the sliders. spooky no? interacting with the fabled `key` book will cause it to recede into the wall as the lights start to go crazy and the room shakes once again. once everything calms down there will be a soft glow emanating from the fireplace along with a the key laid down on the mantlepiece. 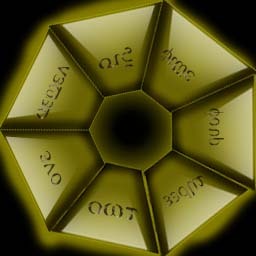 the player can then pick it up and then exit the house. causing the game to fade to black and end. there is one particular detail I am keen to incorporate if I have enough time. I wanted to have a Victorian style picture frame with an image of a man sitting in a chair with a curly moustache smoking a pipe. a typical gentleman if you will. and I want the image to change depending on what point of the puzzle the player is on. 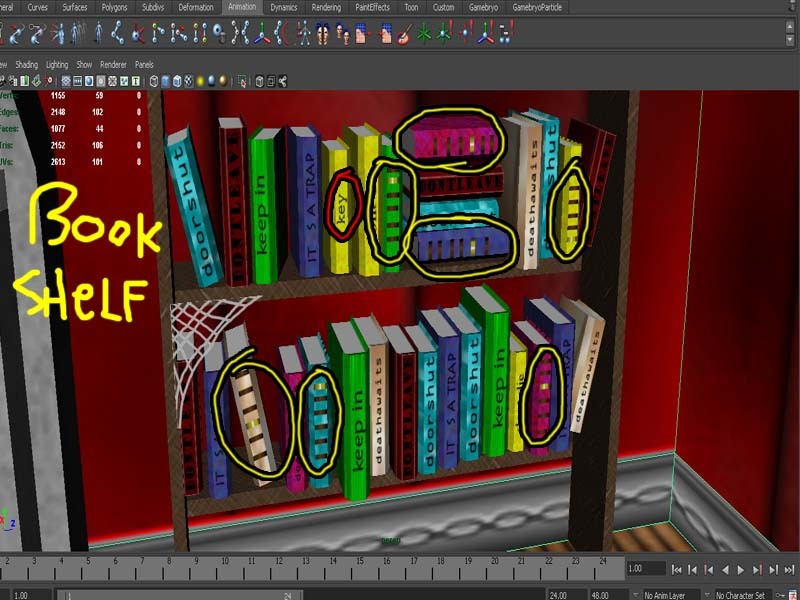 for example if the player is on the second puzzle tube puzzle involving the books, he may imitate reading a book to guide the player. 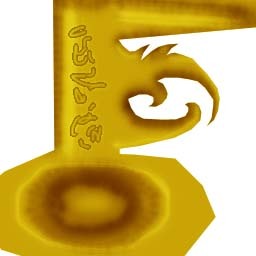 or if the player has finally obtained the key,he may smile and give the thumbs up. it`s a simple mechanic but it softens the difficulty of the game in a subtle way,no handholding here. wish me luck on getting this all created 😀 here,have some assets for going through the bother of reading my blog.